Dave’s Gourmet Ghost Pepper Hot Sauce is an EXTREMELY HOT sauce. Anything with Ghost Pepper is going to have an INTENSE BURN like this sauce. There isn’t much flavor to this dark red sauce outside of the Ghost Pepper pain. This runny sauce is dark red, thin, and filled with black speckles. I have to admit that the spice level is outside of my tolerance, but would be perfect for anyone who loves REALLY, REALLY, SPICY sauce. Overall, this sauce is not for the weak; try it with caution because the burn lingers. This sauce is dark red, thin, with little black speckles. It has a runny consistency. It smells like spicy peppers. It has a slight spiciness to the scent, but it’s deceiving because the taste is EXTREMELY spicy. The spice level is INSANE. Even after a tiny taste, my mouth was ON FIRE! Allow me to confirm that the Ghost Pepper definitely makes this sauce VERY SPICY with a major burn. I tasted Dave’s Gourmet Ghost Pepper Hot Sauce with caution, preparing for the burn. It has immediate burn that even lingers for a while after tasting the sauce. 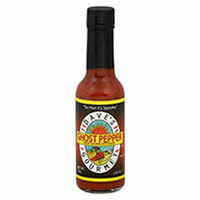 Dave’s Ghost Pepper Hot Sauce has all natural ingredients without preservatives. 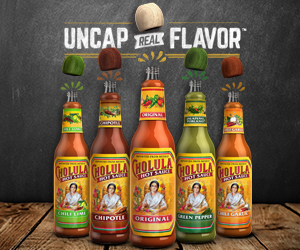 The Ghost Peppers and hot pepper extract are clearly responsible for the burn and spicy flavor, while the rest of the ingredients are hard to taste because of the strong burning flavor. When I added this hot sauce to cooked chicken and allowed it to cook a bit, the sauce remained SUPER SPICY. The 5 oz bottle costs $9.10. That’s one of the pricier hot sauces I have tried so far, but still it’s not bad considering a little sauce goes a long way.